Occasionally, when you try to run a macro, an error message will appear, such as the "Run-Time Error '9'" Subscript Out of Range" error shown below. On this error message, there are 3 buttons available -- End, Debug and Help. To stop the macro, click the End button. To get information about the error, click Help. In this case, you would end up on page on the Microsoft website, with a list of possible causes and solutions for the Subscript Out of Range error. 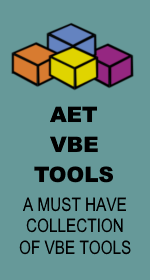 To go to the VBE and try to solve the problem, click the Debug button. In this example, a macro was recorded, to go to a sheet named "Main", then select cell C3 on that sheet. When the macro is run, the above error message appears. The VBE opens, showing the GoToMain Sheet macro, and a line of code is highlighted in yellow, with a yellow arrow n the margin at the left. 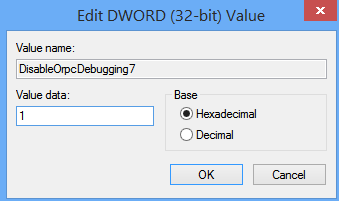 Excel showed the error message, because it can't complete the highlighted line of code. 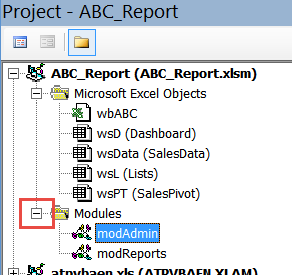 Look in the Project Explorer window, and check the list of sheets for the active workbook. There are 3 sheets, named "Intro", "Sheet2" and "Sheet3" -- there isn't a sheet named "Main"
We'll stop the debugger, and fix the code. The code stops running, and the yellow highlighting disappears. Next, you'll edit the code, to change the sheet name. In the line of code, you could replace "Main" with "Intro", which is the current name of the first sheet in the workbook. However, with that solution, the code could show an error again, if anyone changes the sheet name in the future. Instead of using the name from the Sheet tab, we'll use the sheet's Code Name. It is much less likely to be changed, by anyone other than the programmer.. In the Project Explorer, you can see the sheet's Code Name, followed by the name that appears on the sheet tab. The first sheet's Code Name is "Sheet1", so change the code to use that name. This solution is better, because the code will continue to run, even if the name on the sheet tab is changed. 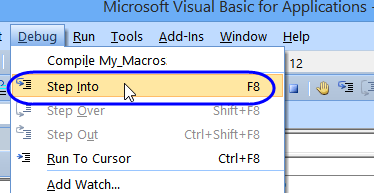 Run the macro again, and it should work correctly, without showing an error. 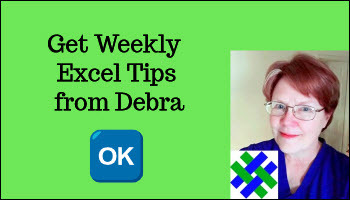 When debugging Excel VBA code, you can use the F8 key, or the Step Into command, to step through the code, one line at a time. However, in Excel 2010, you might encounter the problem where the F8 key (or Step Into) stops working, part way through a procedure. Sometimes, this occurs after the code opens another file. Instead of stopping at the next line of code, it runs to the end of the procedure, or to the next breakpoint. 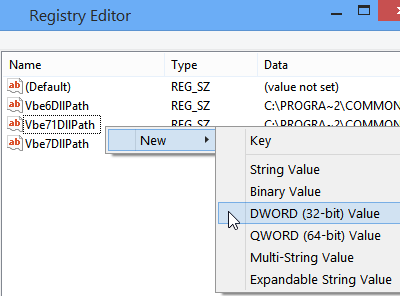 To fix this problem, you can make the following change in the Registry. As always, make a backup of the Registry, before making any changes, and try this at your own risk! Thanks to Ross Connell, for sharing this solution. 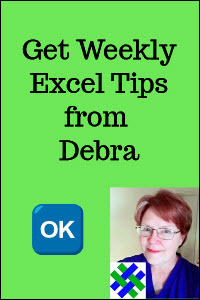 Change Value to 1, and click OK.
Close the Registry, and re-open Excel, where the F8 key should now work correctly, stepping through the code. 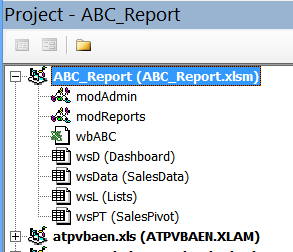 When you work in the Visual Basic Editor, the Project Explorer is usually visible, showing a list of all the open VBA projects. Click the + or - button at the left of a project name, to open and close the list of objects for that project. 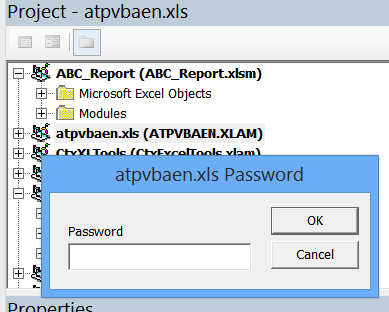 NOTE: If a project is protected, and hasn't been unlocked during the current session, you will be prompted for a password when you click the + button. Then, click the + or - button at the left of a folder name, to open and close the list of objects for that folder. 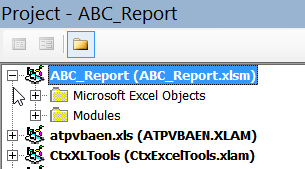 Occasionally, the project explorer folders might disappear, and an alphabetical list of the workbook's objects appears below the project name. In the toolbar at the top of the Project Explorer window, click the Toggle Folders button. The folders will reappear for all projects, with objects groups into folders.